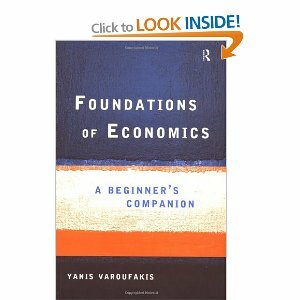 The Economics Anti-Textbook: A quick note on "Foundations of Economics: A Beginner's Companion"
A quick note on "Foundations of Economics: A Beginner's Companion"
Somehow Tony Myatt and I spent many years talking about the subject matter of The Economics Anti-Textbook and then writing it without stumbling upon Foundations of Economics: A Beginner's Companion by Yanis Varoufakis, then at the University of Sydney and now at the University of Athens. But last week, after a friend urged me to work to combat the indoctrination of economics students (rather than loaf, my natural inclination), I did finally stumble upon it after idly googling "economics students indoctrination". Google found the book with this because of Chapter 12.2 of Varoufakis's book is entitled "Economics courses as indoctrination", with subsections "The economists' narrative against cooperation", "The economists' dilution of the concept of social responsibility", "Teaching that value exists only if it can be quantified", "The economists' apology for inexcusable social failures", and "The economics profession as a priesthood". Obviously intriguing stuff. Varoufakis tries, in a general way, to do what we did in the Anti-Textbook: to set out what he sees as the essence of the theory and to critique it, but adding in along the way some intellectual history about where these parts of the subject came from in the first place. I ordered a copy immediately and it arrived today. I'll write some more about it here in the future when I've had a chance to delve into it properly. As the image above suggests, you can have a peek inside the book on the Amazon website. The publisher's list price is steep (US$80 or so for a paperback, at least in North America), but it's a 400 page book that any serious economics student should not be without. Get someone else to pay for it; ask for a copy for Christmas! PS: You can also find used copies at half price. In looking for used or out-of-print books, I often use this search site, which looks in many databases.